Most small businesses will eventually get a bad review or two when a mistake is made or there is some misunderstanding that occurs. Even the most vigilant business owners face it at one point or another. How you handle negative reviews can be extremely important in not only mitigating any potential damage but also in further signaling how your business takes care of its customers and their concerns. You should really view a negative review as an opportunity rather than let it frustrate you. Most people understand that a business, like anything, cannot be perfect. There are certain challenges and things that will happen and sometimes you just won’t be able to control everything the way you would have preferred. When a customer leaves a bad review, it is important to try to understand what exactly happened, to apologize for any wrongdoing, and to show that you are taking the situation seriously and working to change something to avoid a similar issue in the future. The fact that you respond alone shows that you care about the customers and what they think about your business. This is important in helping you win over new customers and in maintaining good relationships with your existing base. Always thank the person for the review regards of whether or not you agree. It is important to be polite and respectful at all times. This is a reflection on you and your business. Any review that is over the top crazy will likely be recognized as such by other customers, so don’t fret too much over something that is just too crazy. Do still reply though as noted. Education can also be important in certain cases where it was a misunderstanding on the customer’s part. Just be sure to do it in a way that is respectful and not demeaning to anyone. You know your business better than anyone, so misunderstandings are bound to happen externally sometimes. The other important part of responding is to do so in a timely manner. Generally, 24 hours should be a goal for a response from when the original review was left. This shows that you are actively keeping up with customer feedback and addressing it appropriately. 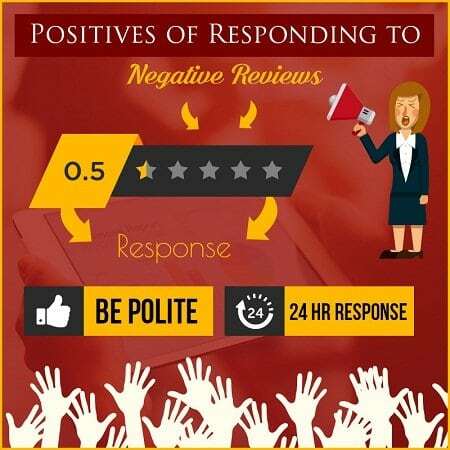 It also increases the chances that the negative reviewer sees your responses and maybe even responds back positively which would be a big win. A negative review handled the wrong way can be a big hit to your business, so never take it lightly. Reviews can be very important for search engine optimization (SEO) and your long-term marketing strategy, so always take it seriously. Local SEO is particularly important these days and the reviews often appear right in the Google search above the fold. A good response may show up with it or at least allow you to get other positive reviews in the future so that your overall score appears better and you get better click through and conversions from Google searches. Just as in real life, you have to take care of all of your customers and protect your image.